How do you solve a problem like Lewandowski? The Polish superstar has understandably dominated the pre-match headlines before his country's Euro 2016 qualifier in Scotland. 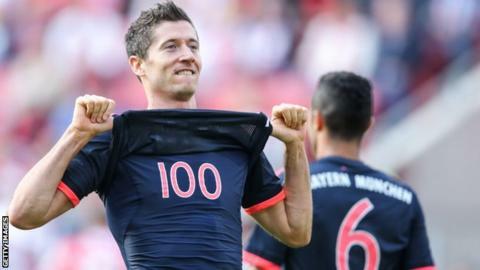 Robert Lewandowski's recent spectacular goal-scoring exploits for club and country have drawn looks of admiration. A look perhaps reserved for those who are not charged with stopping the Bayern Munich striker. However, Scotland boss Gordon Strachan is not incautious enough to assume the poster boy of Polish and, currently, Bavarian football is the only threat to the Scots' slim hopes of reaching the Euro 2016 finals. Yes, Lewandowski will not have his ammunition supplied to him by the likes of Thomas Muller - who to this point has done more damage to Scotland's short-term aspirations - and fellow World Cup winners Mario Gotze and Xabi Alonso. But the Warsaw-born striker - who will chase his 30th international goal at Hampden Park - is merely at the top of an impressive Polish spine. Most in-form international sides are built around this. Wales have Williams, Ramsey and Bale. Croatia can call upon Corluka, Modric and Mandzukic. Belgium know Kompany, Witsel and Hazard will form the basis of their side. The respective coaches of these teams will pick these players then fill in the blanks. Polish coach Adam Nawalka - who is under severe pressure to qualify - is in a similarly luxurious position. With Lewandowski leading the line, centre-half Kamil Glik, captain of Italian side Torino, looks after the other end of the team. Glik is in arguably the best form of his career and has been linked with a £10m move away from Turin. The 27-year-old was superb when the Poles defeated the Germans a year ago and has gone from strength to strength since. In the engine room will be another Pole who is also one of the first names on Nawalka's team-sheet. Grzegorz Krychowiak is in buoyant mood, despite a relatively slow start to the season with Sevilla following links with Arsenal. Not content with helping his club win the Europa League in his first campaign in Spain, he scored his side's opener in the thrilling final win over Dnipro in his own country's capital. The powerful defensive midfielder was superb at the weekend when his side beat Barcelona 2-1 in the Ramon Sanchez Pizjuan. And, while Lewandowski sports the captain's armband, Krychowiak is the team leader. His central partner may be Legia Warsaw's Tomasz Jodlowiec, who impressed against Celtic in Champions League qualifying last summer. The one area of the Polish side that has been a bone of contention is that of goalkeeper. Wojciech Szczesny - who is on loan at Roma - started against the Scots last October but has since been replaced by his former Arsenal understudy, Lukasz Fabianski. Swansea City's Fabianski remains the chief candidate to finish the campaign as number one. Nawalka must decide whether to reunite his right-side pairing of Lukasz Piszczek and rampaging winger Jakub Blaszczykowski. The two were regulars - along with Lewandowski - during Jurgen Klopp's glittering Borussia Dortmund tenure, although the latter lost his place at the club and the national captaincy following a cruciate tendon knee injury. That contributed to the 29-year-old flitting to Fiorentina in Serie A for the season, but he has rediscovered some of his old form. It is a talented group of players and that is without even mentioning three that stood out against the Scots in the 2-2 draw earlier in the campaign. Kamil Grosicki, along with goal-scorers Krysztof Maczynski and Arkidiusz Milik, are also likely to start at Hampden. Milik recently made his move to Ajax permanent from Bayer Leverkusen and the Dutch side looked an entirely different proposition with him in the team as they came from behind to draw with Celtic in a recent Europa League tie. He is certain to start up front as Poland seek the victory that would ensure their qualification should the Republic of Ireland fail to beat Germany. And there is no better company to be keeping right now than Lewandowski.